Nathan: LCM specializes in production of Hydraulic Presses. We are here today with Nelson Wang, president LCM. Thank you for your time. Could you tell us a little bit about your company, products and technologies you offer? Lien Chieh Machinery Co. was founded in 1947, specializing in the production of Hydraulic Presses for a wide variety of functions. What sets us apart is that unlike other companies most of our products are custom made to fit specific applications, spanning over a wide range of industries. For example the automotive industry, metal forming industry and forging industry. Regarding forging processes, there is hot forging, cold forging and warm forging. 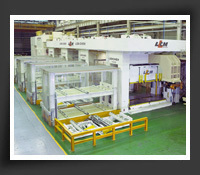 We also provide presses for production of huge aluminum parts, rims or aircraft components. In the construction materials industry, we cover plywood, cement board, as well as carbon fiber panel production, each of these applications require custom products. 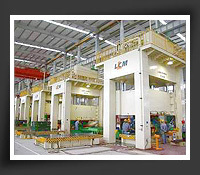 Lien Chieh Machinery Co. has operated in this field for decades. All together we have a more than 60 year history. We have an outstanding team that can cater to different customer’s requirements. Nathan: What are some of the recent technologies you have been developing? On our end, we are also developing new servo presses, but we will focus more on heavy duty (large tonnage) presses. We recently have received customer orders and the current order is for a large 2,400 ton mechanical servo press. This type of product range represents our main direction and target for this year. Nathan: Why are you focusing on servo press technology? Just recently, manufacturers have developed 200 to 300 KW heavy duty servo motors. I think it is a good timing and opportunity to use this technology in the machinery industry, since all of our products require large horsepower. Also, with this feature, we can create products which are more energy-saving and lead to more efficient production for our customers. Nathan: Which industries will benefit from the servo press technology? The development of servo press technology will definitively improve automotive sheet metal forming, hard metal material forming and other complex molding materials which are very difficult to be molded. When it comes to energy-saving, it can save up to 30-50%. This will have a positive impact to our planet’s environment. Nathan: Well, thank you for your time and we are looking forward to seeing your new products in the upcoming shows. 800~1600 ton fully automated High Speed Hydraulic Tandem Line with sheet metal processing equipment, washing unit, centralizing system and robots. 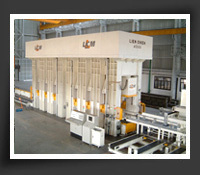 800~1200 ton Hydraulic Drawing Press for manufacturing car bodies. 4000 ton Hydraulic Drawing Press with two moving bolsters for manufacturing truck side members. 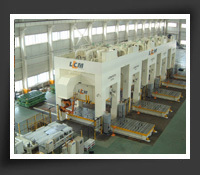 1000~1500 ton Hydraulic Drawing Press with twin die change & storage system installed in Taiwan.